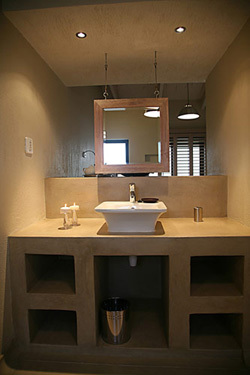 Henties Bay accommodation Guide - information and photographs of Ietsiemeer Beach House Henties Bay Namibia. ietsiemeer is the most beautiful house set on a most unbelievable coastline. 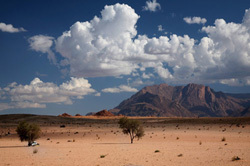 Situated in the fisherman's village of Henties Bay, it is also on the doorstep of the Namib Desert and the Skeleton Coast. ietsiemeer (literally translated as "a little bit more") is situated on the beach. Be prepared to be awakened by the crashing waves of the Atlantic Ocean! 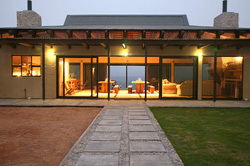 The Beach House has recently opened its doors to the public. 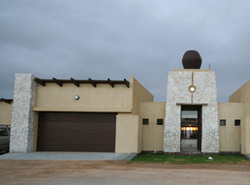 This unique home was created for a family to have dream holidays together. The architecture is classic with a contemporary twist. Local influences are in abundance with the water tank idea from Wlotskasbaken as well as generous use of natural stone from the surrounding area. The House has a large central pavilion area. This is the heart of the house where you will find the lounge, dining and kitchen areas with breath-taking views of the ocean. The deck provides the perfect setting for spectacular afternoon sunsets. 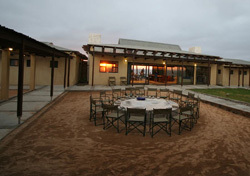 The central courtyard area contains a typical Namibian braai-area and provides the necessary shelter from cool evening sea breezes. There are six large luxuries private rooms with en-suite bathrooms, all have beautiful, unobstructed views over the Atlantic Ocean. Two Double garages provide security for vehicles. 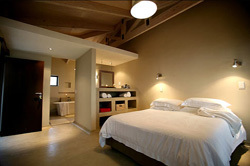 The Beach House offers luxury accommodation, with all the necessary home comforts. This includes cutlery, crockery, cookware, dishwasher, coffee machine, etc. 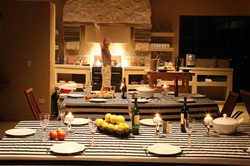 Breakfast and evening meals can be arranged, including a typical evening braai in the courtyard with lanterns and candles. Picnic baskets can also be requested for day trips. Ample cooling facilities are available for the convenience of guests. Cold beer and wine is available from our honour bar. Special requests will be catered for by the hostess.